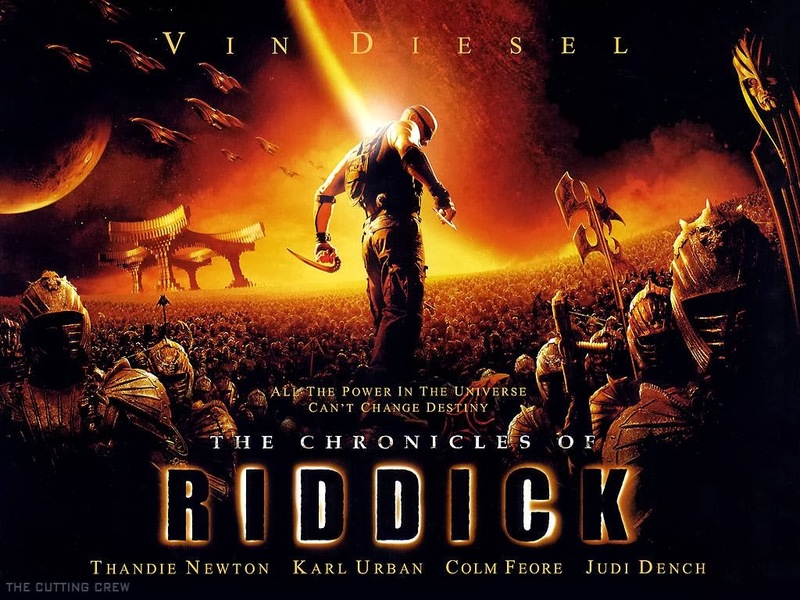 The Chronicles of Riddick is a 2004 American science fiction film which follows the adventures of Richard B. Riddick as he attempts to elude capture after the events depicted in the 2000 film Pitch Black. It is written and directed by Pitch Black director David Twohy, with Vin Diesel reprising his role as Riddick and now also acting as producer. It is the first and only film in the franchise, to date, to be given a PG-13 rating. After escaping the dark planet, Richard B. Riddick has been in hiding for five years, evading most of the bounty hunters and mercenaries. Riddick is reunited with Imam, the man he rescued. Imam believes Riddick is a Furyan, a race of warriors long thought extinct, and wants to know about his homeworld and if anyone other than himself is left. Recaptured by Toombs, Riddick is taken to Crematoria, a harsh subterranean prison moon, where Jack, a girl Riddick rescued, was reported to have been sent. After the release of the film, The Chronicles of Riddick became the brand name of the series. Despite not doing especially well in theatres, the film has been successful on DVD and has gained a cult following. After escaping the dark planet, Richard B. Riddick has been in hiding for five years, evading most of the bounty hunters and mercenaries that are set to capture him because of his high price on his head. His latest hideout is a Planet U.V., a world lit only by ultraviolet light. He evades the bounty hunter Toombs, killing Toombs' crew and stealing his ship. He then heads to New Mecca in the Helion System, after Toombs reveals his bounty originated there. Once there, Riddick is reunited with Imam, the man he rescued. Imam believes Riddick is a Furyan, a race of warriors long thought extinct, and wants to know about his homeworld and if anyone other than himself is left. Imam believes Helion Prime is the next planet to be conquered by a mysterious force crusading across the stars. Aereon, an Air Elemental, identifies the army as the Necromongers, religious fanatics who seek to convert everyone and kill those who refuse. The Necromongers invade that very night, overwhelming the defense forces and take control of the capital. In the ensuing battle, Imam is killed and Riddick escapes. The next day, the Necromonger high priest called 'The Purifier' coerces the populace into converting, except for Riddick, who defiantly kills the man who killed Imam. Intrigued, the Lord Marshal orders Riddick be scanned by the Quasi-Dead, half-dead telepaths, who determine that he is indeed one of the few remaining Furyans. Lord Marshal orders Riddick's death, but Riddick escapes the Necromonger ship and allows himself to be recaptured by Toombs. Riddick is taken to Crematoria, a harsh subterranean prison moon, where Jack, a girl Riddick rescued, was reported to have been sent. He meets up with her as the Prison Warden warns Toombs of the "Ghost Army" killing entire worlds and leaving behind dead Systems. They have various names but all seem to be aware of the threat they pose. Once Riddick escapes, the Lord Marshal sends Commander Vaako to hunt him down, an easy process since Toombs' ship left behind an easily traceable path. Vaako's wife speaks to Aereon, who reveals that Furya was devastated by the Lord Marshal after he was told a child from that planet would kill him. Dame Vaako and her husband determine Lord Marshal wants Riddick dead, as he may be the child of said prophecy. On Crematoria, a disagreement breaks out between Toombs and the prison warden over what Toombs is owed. Word about the Necromongers has reached the prison warden, who deduces that Toombs has stolen a prisoner from the Necromongers. Meanwhile, in the prison, Riddick finds Jack, now named Kyra, and they eventually reconcile. Later, the guards kill the bounty hunters, take the reward money and prepare to leave before the Necromongers arrive. Riddick leads several prisoners across Crematoria's Volcanic Surface to steal the ship. The guards reach the hangar, just as the prisoners arrive outside of hangar doors to find the Necromongers have cornered them there. All of the guards are killed and Riddick is incapacitated by Vaako. With the approach of the vicious sunrise (from -300 to 700 degrees in seconds), Vaako leaves Riddick to die; Kyra is then captured by the Necromongers. However, Riddick is saved by the Purifier, who tells him that if he stays away from the Necromongers, they will not hunt him. The Purifier then reveals that he too is Furyan, and that Vaako will report Riddick as dead, giving Riddick the element of surprise. The Purifier then commits suicide by walking out into the scorching heat after he encourages Riddick to save Kyra and kill the Lord Marshal. Meanwhile, Vaako reports Riddick dead and is named heir apparent by the Lord Marshal. Riddick flies back to Helion Prime using Toomb's spacecraft. Riddick, disguised in Necromonger armor, infiltrates the main hall; Dame Vaako sees him, but encourages her husband not to warn the Lord Marshal, but rather to let Riddick strike first to wound the Lord Marshal and pave the way for Vaako to kill him and thus to take his place as leader. When Riddick attacks, the Lord Marshal presents Kyra, who appears to have converted. Riddick fights the Lord Marshal one-on-one in front of his army, who prevails with his unnatural powers. When it appears that Riddick is about to be killed, Kyra stabs the Lord Marshal in the back, in the "sweet spot" that Riddick speaks about in Pitch Black, with a spear. The Lord Marshal punches her into a column of spikes, mortally wounding her. Vaako then makes his move to strike the wounded Lord Marshal, but misses. Riddick figures out Lord Marshal's vulnerability and kills him. Kyra dies, and the Necromongers kneel before Riddick, who is now their new leader.